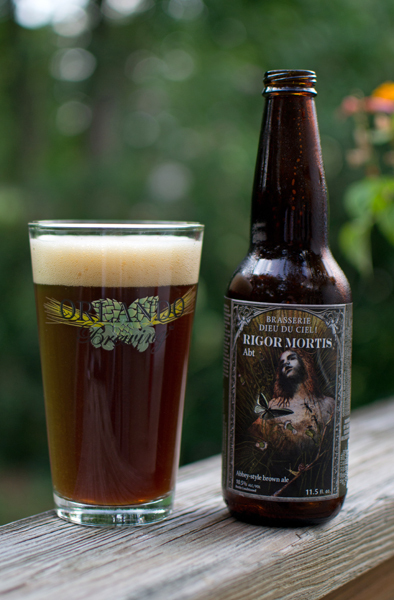 Interesting name for beer #253, Rigor Mortis. Brewed in Quebec, Canada, this Quadrupel has a hefty ABV of 10.5%. It mentions on the label that is it best enjoyed six months after bottling but I couldn’t find a date on it. Into my Orlando Brewing pint glass went this murky brown brew. Sitting pretty on top was a nice tan head. Lets give the old Rigor Mortis a whiff…shall we? The first thing I pick up on was the heavy presence of alcohol with raisins, brown sugar, grapes, and dark roasted malts. I took a sip…it had a dark fruity sweetness up front that morphed very quickly into chocolate & caramel. The alcohol comes into play near the back end of this with a nice warming sensation as I swallowed it. It had a chocolaty aftertaste also which was nice. It was medium bodied, lower in the carbonation department with a nice smooth, almost coating sensation. For me it was a sipper due to the higher ABV. Not too shabby. A solid brew from our neighbor (at least if you are in the United States) to the north. A bit much for the warmer summer months but would be very nice in the winter. It is always winter in Canada…isn’t it? Sleepy…that is how I feel today. After getting in super early this morning from a very interesting flight from Washington DC to Philadelphia, I needed to relax. I have never been on a flight that started to take off but then aborted that take off after about 100 yards down the runway only to be transfered to another plane (due to mechanical issues) where we watched the airline mechanic apply what amounted to duct tape on the pilots windshield. Strange but true…anyhow, time for a beer. Beer #133 is by our old brewing friends at Victory. 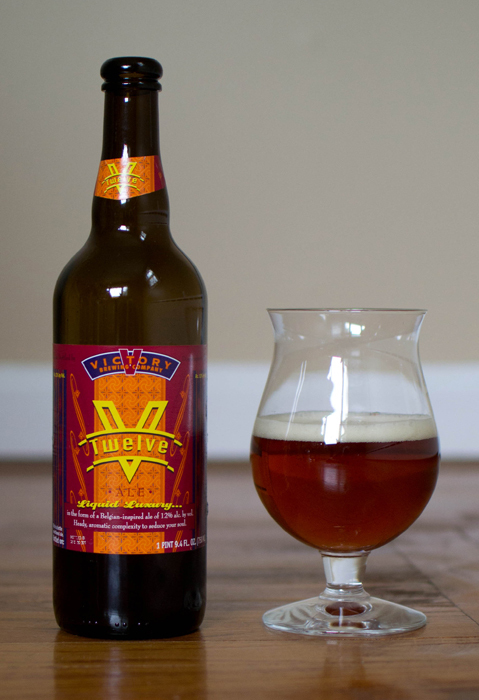 V-Twelve is a Quadrupel with an ABV of 12%. Yowzer…going to be a hot time in the city tonight. I haven’t broke out the tulip glass in a while, so into it went this brew. Amber was the color of the day here with a one finger width head. I think I poured it too gingerly as other photos of this I have seen have had a huge fluffy head. I got some pear and pineapple in the nose along with some caramel malts. Oh yeah…the alcohol was there also, how could it not at 12% ABV? The taste was more malty (think bread) than the nose let on. I got a bit of cherry which was odd as I didn’t really get anything like that is the nose. There was a bit of spiciness here also. The alcohol had a nice bite and warming sensation near the end of the sip. The mouthfeel was just shy of being heavy and it had some decent carbonation going on. Sip with caution…it is pretty drinkable for a beer with a high ABV. I liked this a lot. It wasn’t as sweet as the nose led me to believe. It was a perfect drink for a lazy Sunday watching movies & trying to rest up from my vacation. Well drinking a beer with seaweed (see yesterdays review) did nothing to ward off the snowstorm. I awoke to 6 inches of fresh white powder and an odd taste in my mouth, sort of like the Atlantic Ocean. Beer #45 is Three Philosophers by Brewery Ommegang. 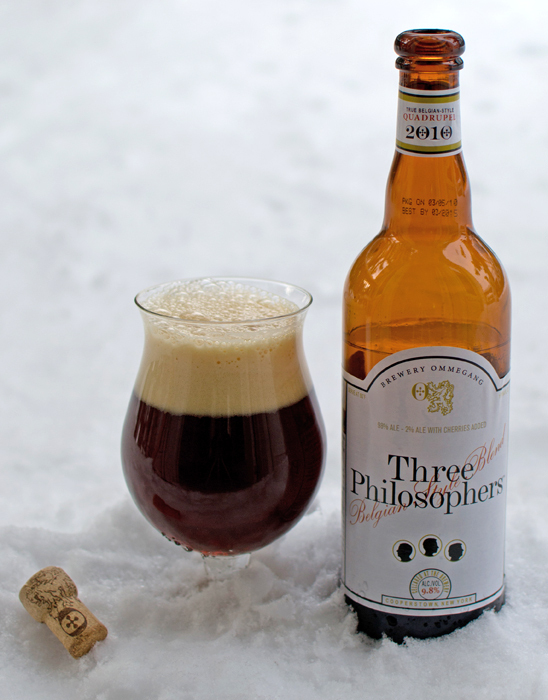 Three Philosophers is a Quadrupel. It was created by blending a Belgian ale with a cherry lambic. The ABV comes in nicely at 9.8%. It has been a while since I broke out the tulip, so into the snow it went. The head was absolutely magnificent! Big and fluffy! The color of this brew was a deep dark brown just slightly cloudy. The nose was cherries and roasted malts and that Belgian yeast aroma. Taste was booze up front followed by some sweet cherry flavors. Mouthfeel was really nice and smooth with a slightly heavy body…almost syrupy. I could drink this all night long…at a slow pace that is. I liked this quite a bit. Good stuff indeed!